UPA chairperson and former Congress president Sonia Gandhi led a protest over the issue in front of Mahatma Gandhi's statue in Parliament complex. Opposition MPs, including Raj Babbar, Ghulam Nabi Azad, Anand Sharma, Ambika Soni, CPI's D Raja, AAP MP Sushil Gupta among others held a protest outside Parliament, holding placards and raising slogans demanding a joint parliamentary committee (JPC) probe into the issue. 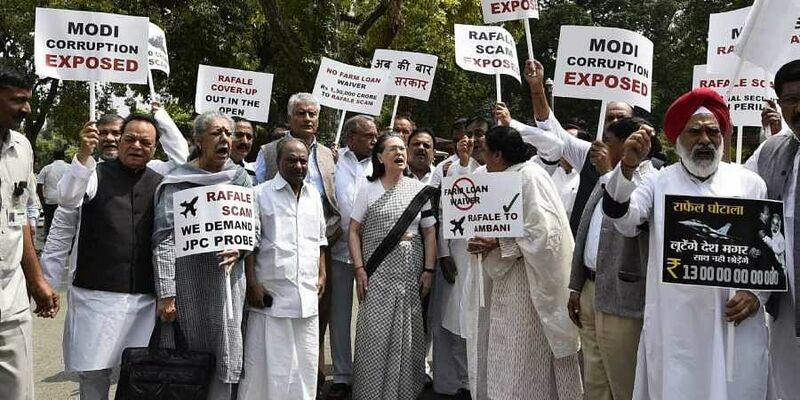 Congress members yesterday had created uproarious scenes in the Lok Sabha demanding a probe into the Rafale deal by a JPC, forcing an adjournment of the proceedings. They were heard demanding a JPC probe into the deal and a reply from Prime Minister Narendra Modi. As the government prepares to table the much-debated Triple Talaq Bill in the Rajya Sabha today, Gandhi, when asked about the issue, told reporters, "Our party's position is absolutely clear on this, I will not say anything further on this. The IAF needs new planes as a mattter of urgency. The UPA's inability to do anything without kickbacks had literally decimated the IAF. They have no choice now but to fault the ones that did something to help the IAF. The Public Sector Undertaking in India have had 70 years of non-performance. Ambani or Somani, they are not likely to be as bad as out PSUs. They are answerable to the shareholders. Pity the Congressmen for not having any worthwhile topics to take on the honest scam-free NDA ! All that they have to do is bluff around the same trumpet !